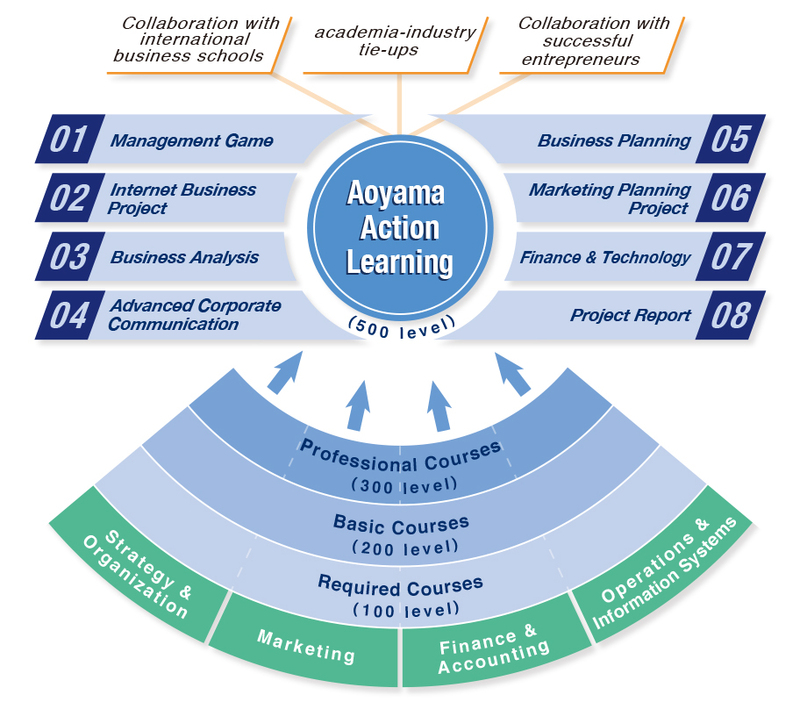 "Aoyama Action Learning" (AAL) courses plays a summarizing and comprehensive role in the Aoyama Business School (ABS) MBA program. There are eight courses thatfor second-year students can complete. These courses are hands-on learning experiences that link management theory with actual business practices. AAL is designed to integrate the specialized knowledge of management previously acquired by the student with group work in management analysis and strategic decisions, providing students with creative abilities for pioneering new markets and the skills required for business success. Students also engage in practical collaborations with successful entrepreneurs and in academia-industry tie-ups. AAL thus fosters the creative business leaders needed in the contemporary world. ※The content is current as of the creation of this page. ※Click on a title to display details regarding the course. Management simulations to compete with overseas MBA management programs. Mock Board of Directors (BOD) Meetings: real experiences to acquire management practices. In this course, four or five students form a group and run a "virtual" consumer financing company. A business simulation is performed jointly with students of MBA universities overseas, including Carnegie Mellon University and other top schools. The students thus gain experience in global competition. All materials are in English and communication occurs mainly via email and using the Web. The purpose of this course is to provide students with an overall understanding of corporate functions, including management, marketing, finances, accounting, and operations. The students experience real problems and issues faced by managers, developing their problem-solving skills. Such problems include, for example, management planning, presentations, and approvals at BOD meetings, risk management, team motivation, and information disclosure to shareholders. Learning public relations, financial policies, governance systems, and other key corporate communication functions and practices. Developing the abilities of a Corporate Communications Officer (CCO). Deepen knowledge of finance and accounting and learn company-analysis and evaluation methods. Systematic learning on how to use cutting-edge information technology (IT) to create business strategy-related concepts, to develop and implement applications, and to steadily progress in business projects. In our contemporary era, IT and the Net are not only requirements to regular business duties, but also essential tools for management strategies. In this course, the academic year is dedicated to project-based learning, especially in the conception and realization of e-commerce (EC) business projects. The students will go through several practical stages, from planning to implementation. Since they actually develop their projects, they can learn how to use ever-changing IT to tackle various key consideration points. Story-centered learning is used to develop and internalize these important skills. This course is designed to close the 2-year MBA experience in real-world skills and includes business strategies, Net marketing and customer acquisition, e-commerce and detailed advice on how to set up and operate a website, with a variety of related techniques and methods plus product appeal and evaluation. Students gain experience in developing business ideas from their inception to the establishing business plans. Acquiring the skills and knowledge required for startup businesses and establishing plans for their extension to new businesses. Small groups will create highly feasible new business plans, perfecting them in order to be presented to venture capitalists and angel investors. Such dynamics will provide students with the ability to launch new business ventures within a company or on their own in a near future. A special focus will be given to the development of highly feasible business models and to management control for each development phase along with marketing strategies. Students will learn how to emphasize customers’the standpoints of customers and thus become able to create businesses to serve them. accordingly.Actual entrepreneurs, venture capitalists, and investment angels will be invited to evaluate student proposals, igniting an entrepreneurial spirit in each student. This course focuses on the development of a highly feasible business model and on management skills for each development phase, with a further emphasis on marketing strategies. It aims to develop the ability to always emphasize the viewpoints of the customers and create businesses that will meet their goals and aims. Through industry-academic collaboration, students will be trained in themes related to actual business issues and learn practical planning of relevant marketing strategies. n order to tackle actual marketing-related issues faced by real companies, such as branding, channel strategies, and communications policies, each team will perform surveys, make analyses, and propose structured solutions to their target companies. This process will start with a company-based orientation and with quantitative and qualitative surveys and analyses of customer needs. Then the students will use the products and services of their target companies and of competitors, and perform other fieldworks. In addition, the students will include related studies of prior cases and present their ideas through methods such as brainstorming, in order to adjust and improve their final concrete proposals. At the end of the course, the students will make presentations to their target companies, which in turn will evaluate their proposals. It is possible that these companies actually adopt the students’ proposals, which reveals how seriously involved the companies are in the learning process and gives the course a strong sense of reality and a practical nature. Understand the current state of finance-related technologies (artificial intelligence, block chains, etc.) and challenge future developments in this field. The so-called "4th Industrial Revolution" is advancing through computer technology. This wave of innovation is causing a breakdown in the existing industrial structure. This applies to finance divisions: every day, newspapers use the term "FinTech" in their reporting, revealing a merger of finance with technology. New businesses and existing financial institutions compete in order to provide the best new financial services. A business school dedicated to training business managers must be able to bring these technological innovations to its students. Although these students are not trained as technicians, they must understand such trends in technological innovation to become capable of establishing long-term management policies, as well as conducting effective short-term business operations on a daily basis. The goal of this course is to train business managers to effectively utilize the continually evolving technological innovations. This course is offered only in the second half of the academic year. Therefore, it is highly recommended to complete the finance and accounting practice courses during the first half of the year to prepare for this course. Groups will create research reports equivalent to master's degree theses. The goal is to increase the students’ ability to use academic research methods and write logical papers and documents. The goal of this course is to have full-time MBA students create reports equivalent to master's degree theses. Report guidance and support will be provided jointly by two professors. Report contents will be applicable to a track taught by one of the two professors in charge. Initially, reports will be written by groups of three people each. Data analysis and report-writing skills are indispensable to becoming a businessperson. The students must accomplish the goals listed below throughout the entire course. Using all the knowledge they have gained at ABS through analyses of actual companies, the students will gain understanding and experience in management analysis methods. The students will develop an overall image of target companies using a multitude of existing information and build up a correct understanding and awareness of the actual nature of business management. In order to reach a common understanding with authors who have different viewpoints, students will develop communication skills that will provide them with a superior perspective. 企Students will learn how to write logical documents that will enable them to present their understanding and ideas regarding company management to third parties. "Use of personnel with general skills at major Japanese corporations"
"Global personnel systems at Japanese companies: Comparative analysis of general trading companies and pharmaceutical companies"
"Changing competency models for researchers in domestic Japanese pharmaceutical companies"